The oral changes from tobacco use range from harmless soft tissue changes to a life-threatening oral cancer. Smoker’s melanosis (see Right) is increased tissue pigmentation, or darkening, due to irritation from tobacco smoke. 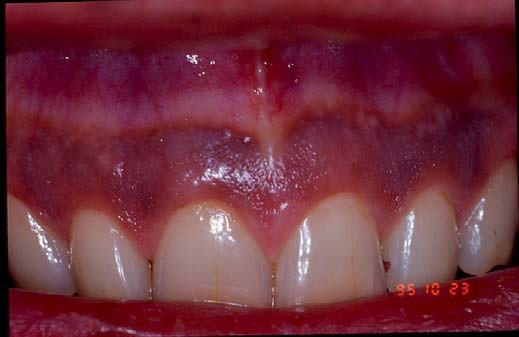 Typically this pigmentation occurs on the gingiva (gums) of the upper and lower front teeth. The amount of pigmentation increases with greater tobacco use, and is more common in females; it occurs in 5.0 – 22% of cigarette and pipe smokers. There is no treatment for smoker’s melanosis; however, tissues typically return to normal color in six to 36 months after quitting smoking. The evidence is overwhelming that smoking contributes to periodontal disease (see Right) and that continued smoking results in a reduced response to periodontal treatment. There is a greater amount of bone loss around teeth in smokers and individuals who smoke are more likely to lose teeth than nonsmokers. It is reported that more than half of advanced gum disease can be linked to tobacco use. In nicotinic stomatitis, the hard palate (roof of the mouth) appears white instead of pink, and numerous, small raised areas with red centers are found throughout the palate (see Left). These red areas are irritated minor salivary glands whose duct openings are inflamed in response to the heat from tobacco products. This lesion is most commonly seen in older male tobacco users who smoke pipes but it also can be found in cigar and cigarette smokers. There is an increased risk for cancer of the tonsils, posterior mouth, and lungs in individuals who develop nicotinic stomatitis from their tobacco use. However, if the individual stops their tobacco use, the appearance of hard palate typically returns to normal within a few weeks. Use of smokeless tobacco produces a specific change in the area of the mouth where it is held. The area appears more whitish and wrinkled than normal, healthy tissue (see Right). This degree of tissue change is directly dependent upon the type of smokeless tobacco (leaf versus finecut), the specific brand of tobacco, the size of the pinch of tobacco, and the length of time the pinch is in contact with the mouth tissues. Although the use of any tobacco product increases one’s risk of developing cancer, the oral cancer risk for smokeless tobacco use is largely unknown. 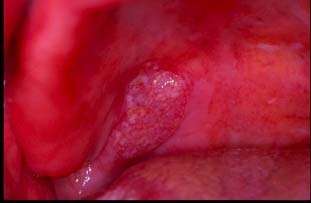 However, use of leaf-type smokeless tobacco for greater than 50 years is associated with the development of a specific oral cancer known as “verrucous carcinoma”. If the individual stops using the smokeless tobacco, the appearance of the oral tissue typically returns to normal in two to six weeks. In addition to the development of changes to the oral tissues, the use of smokeless tobacco can damage both the gum tissue and the teeth in the area where it is held in the mouth. 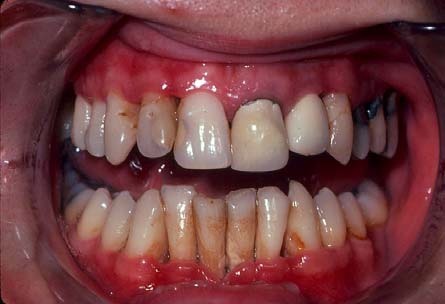 Smokeless tobacco can result in localized gum recession and the exposed teeth often develop dental decay due the sweetener in smokeless tobacco. Unfortunately, stopping the tobacco use does not reverse the gum problem or tooth decay. Hairy tongue (please see PATIENT INFORMATION SHEET: Hairy Tongue) results from either an overgrowth of the normal tongue papillae or a decrease in the rate that the papillae are removed. 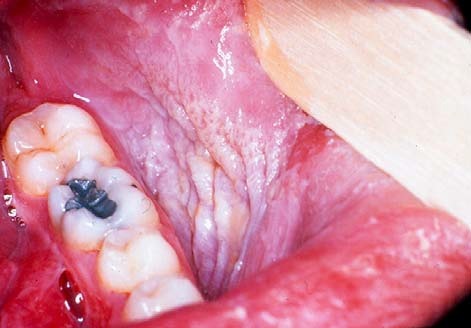 With tobacco use the overgrown papillae can trap pigment from the tobacco and take on a black appearance. This condition has no symptoms; however, it may be a concern due to the appearance and the frequent unpleasant mouth odor from the trapping of particles in the tongue. Use of tobacco products is clearly linked to development of oral cancer (see Below). Oral cancers are found primarily in the floor of the mouth (under the tongue), the sides and underside of the tongue, and the soft palate (the back part of the roof of the mouth). The topic of oral cancer in discussed in a separate Patient Information sheet. The most important key to surviving oral cancer is early detection. The importance of your dentist performing a thorough soft tissue examination cannot be overemphasized. The tissue changes in early cancer can be subtle and it is essential for your dentist to perform a through soft tissue examination to detect cancer at an early stage. He or she may want to take a sample of these tissues (biopsy) for diagnosis, or refer you for this procedure. 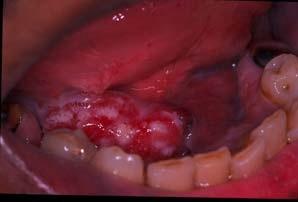 This is the only way to make a diagnosis of oral cancer, and biopsy can also help in determining your long-term outlook. Left: Cancer of the floor of the mouth Center: Cancer of the lateral tongue. Right: Cancer of the soft palate. As soon as an individual quits smoking, the risk for oral cancer begins to decrease. It is generally acknowledged that it takes around fifteen years after quitting smoking for the risk of a prior smoker to approach that of someone who has never smoked.